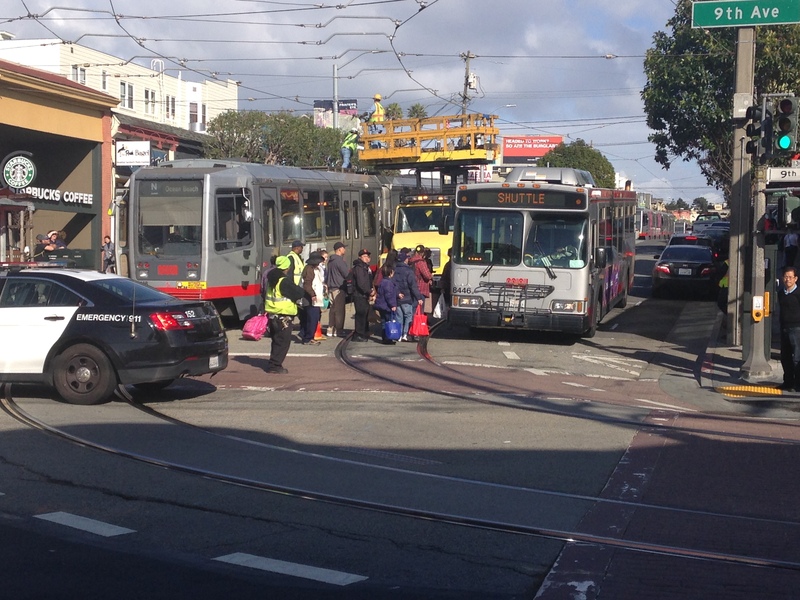 Monday, March 2nd was one Hell of a day for our beleaguered N-Judah line. The fun started in the afternoon just before 3pm, when I happened upon a stalled N on Irving, and smoke! As it turned out, the overhead wire snapped and as such, no trains would be going anywhere. Since I had some time (and all of my errands were within a block or two of the scene), I live Tweeted the fun for those who follow me on Twitter. Guess those weird plastic things paid off after all. You can see in this photo the damage, as well as the parked cars and trucks trapped while they awaited a repair crew. I have to say the speed and professionalism of the SFMTA repair crew has to be commended. I’ve seen them repair overhead wires and other messes before, and in this case, where the train was still under the break. They fixed the cable in about 30 minutes, and everything seemed ok.
SFMTA repair crews fixing the overhead wire that snapped. “Seemed” being the operative word here. That’s because not more than an hour later another N Judah train going westbound was stalled at 4th and Irving! This, right as rush hour started. To add to the fun, an eastbound N was stalled at 22nd and Judah about 45 minutes later! 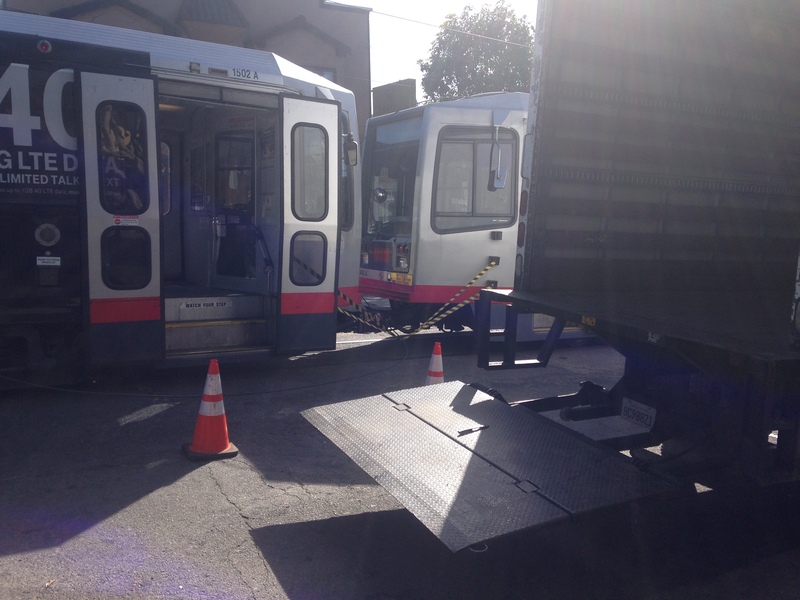 I have to say that even for Muni and the SFMTA, this is a bad situation. To have one of the busiest lines in the system have this many failures, either of LRVs or infrastructure, isn’t acceptable. What makes this worse is that to the folks at City Hall, it’s “nbd” (as the kids say these days), and they don’t care. Instead, we have a mayor who micromanages traffic and safety decisions on Polk Street to benefit his stupid optometrist, but could care less about doing something useful to fix Muni today. Then again, why should he? He can illegally park his little car anywhere he wants. LOL! This entry was posted in MUNI Day To Day, MUNI/SFMTA, N Judah News. Bookmark the permalink.